Hall Place the seat of George Gipps Esq. 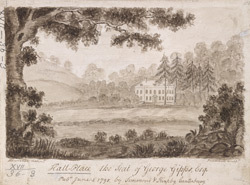 bl.uk > Online Gallery Home	> Online exhibitions	> King George III Topographical Collection	> Hall Place the seat of George Gipps Esq. Situated in the parish of Harbledown, this house belonged to Sir Robert Wilmot of Chaddeson, in Derbyshire. At the time this drawing was made it was the seat of George Gipps Esq., MP for Canterbury. This image is a copy of an engraving by Ravenhill.